Getting and Spending | Use Your Words | Kids VT - small people, big ideas! 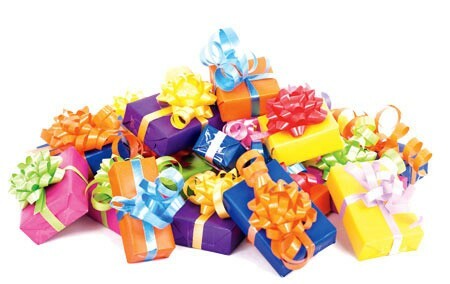 Should we opt out of the gift-giving game? I have always been an avid consumer. As a kid, I collected tiny porcelain dogs and cats, had several Strawberry Shortcake dolls, and about seven My Little Ponies, too. My older sister Tamara, however, is an anticonsumer. Growing up, she had no particular attachment to toys. She preferred to throw my Barbies out of our bedroom window or make up games outside. Not surprisingly, on the day before my daughter Dahlia's third birthday six years ago, my sister and her husband told me they believe that giving children lots of birthday presents just perpetuates a horrible consumer culture of "acquiring things." I kind of lost it. How could they judge when they had no children of their own? Had they ever taken a child to a birthday party? Had they ever had to tell a girl who watched her friends open gifts at their parties that there would be no presents at hers? And what was so wrong with getting stuff anyhow? Didn't I turn out all right? That year we celebrated Dahlia's birthday on Vancouver Island in British Columbia. My parents had rented a house there, and my sister and her husband flew in from Hawaii; we flew in from New Jersey, where we were living at the time. On Dahlia's birthday, my sister revived a beloved family tradition from when my three siblings and I were little. We'd make tall crowns out of colored construction paper and decorate them for the party guests. The biggest and most decorative one was for the birthday girl, of course. When we were done, my mother and Dahlia baked a chocolate cake. It was a lovely, messy affair. Then it was time to blow up balloons with her grandfather. Later we all took a walk through tidal pools where we spotted crabs and picked up tiny sea creatures. Finally, it was time for the presents, and my mother brought out a huge bag of wrapped toys. At first, as Dahlia opened each one, her smile widened and she jumped for joy. But as the presents kept coming, I could see Dahlia's focus shifting from what she was receiving to the next thing still wrapped. The occasion became less about the gifts she received than about the desire for accumulation. When all the gifts had been opened, my two daughters began to fight. My 1-year-old was grabbing at the toys while Dahlia tried to keep a protective circle around "her stuff." My husband suggested Dahlia got too many things, my mother got offended and my sister gave me that wordless look that meant: Weren't the kids having fun and enjoying the day so much more before all the stuff came along? An argument ensued, during which I told my sister and her husband that changing this birthday-gift ritual would be cruel. "Just wait until you have a child of your own," I said, ending the discussion. But the memory of that birthday party stuck with me. Shortly afterward, my husband and I moved to Vermont and had a third child. Living here, we've been able to instill a love of the outdoors in our children, in part by surrounding ourselves with other families who also love hiking, camping, canoeing and biking. Kids here seem to spend more time outside. There's less emphasis on stuff and more on doing activities together with family, friends and as a community. I still believe that giving a gift to a friend or sibling is a big deal and brings joy to children, too, but I have been trying to shift away from the idea that it needs to be purchased from a store. So has Dahlia. This past August, she turned 9. For her birthday she asked to go on a backpacking trip to Sterling Pond with three friends. She asked each of them to bring a favorite book to exchange so they could all take home a "new" one they hadn't read yet. Dahlia also asked them to donate money to Shelburne Farms, one of her favorite places. We agreed to match the amount they gave with birthday money from her grandparents. and she may have started a trend. This year one of Dahlia's best friends donated money to the Humane Society for her birthday. The birthday rituals in our small community are beginning to reflect the values we hold. As an avid consumer, I've struggled to keep my own love of stuff in check. It helps that I hear my sister's voice in my head when I go shopping with my children, saying, Do we really need this? It's just going to end up in a landfill. And my sister? As I write this, she's probably planning a vegan, sugar-free birthday cake for her own daughter, who will be going for a birthday hike in a homemade construction-paper crown.